Euler diagram of types of triangles, using the definition that isosceles triangles have at least 2 equal sides, i.e. 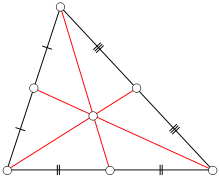 equilateral triangles are isosceles. 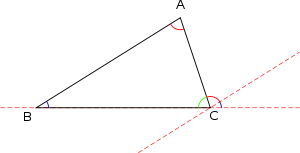 the latter equality applying only if none of the angles is 90° (so the tangent function's value is always finite). 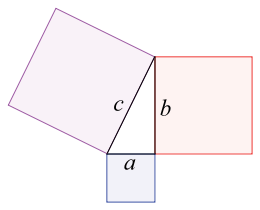 Thales' theorem implies that if the circumcenter is located on one side of the triangle, then the opposite angle is a right one. 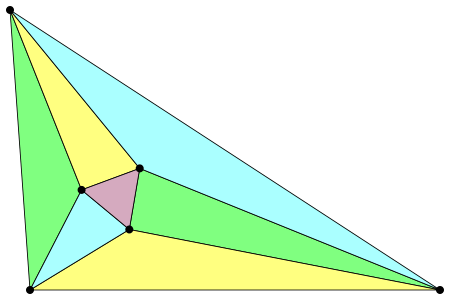 If the circumcenter is located inside the triangle, then the triangle is acute; if the circumcenter is located outside the triangle, then the triangle is obtuse. 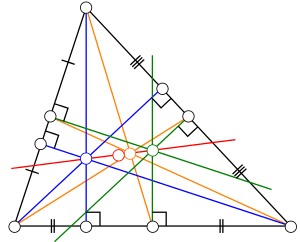 Euler's line is a straight line through the centroid (orange), orthocenter (blue), circumcenter (green) and center of the nine-point circle (red). 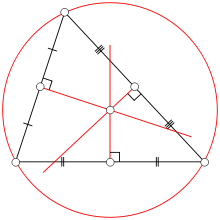 The centroid (yellow), orthocenter (blue), circumcenter (green) and center of the nine-point circle (red point) all lie on a single line, known as Euler's line (red line). 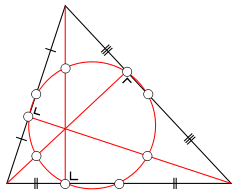 The center of the nine-point circle lies at the midpoint between the orthocenter and the circumcenter, and the distance between the centroid and the circumcenter is half that between the centroid and the orthocenter. 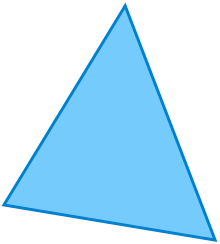 Note that this ratio does not depend on the particular right triangle chosen, as long as it contains the angle A, since all those triangles are similar. where b is the length of the base of the triangle, and h is the height or altitude of the triangle. 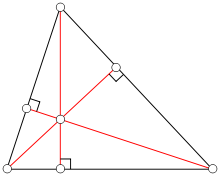 The term "base" denotes any side, and "height" denotes the length of a perpendicular from the vertex opposite the side onto the line containing the side itself. In 499 CE Aryabhata, a great mathematician-astronomer from the classical age of Indian mathematics and Indian astronomy, used this method in the Aryabhatiya (section 2.6). Rectangles have been the most popular and common geometric form for buildings since the shape is easy to stack and organize; as a standard, it is easy to design furniture and fixtures to fit inside rectangularly shaped buildings. But triangles, while more difficult to use conceptually, provide a great deal of strength. 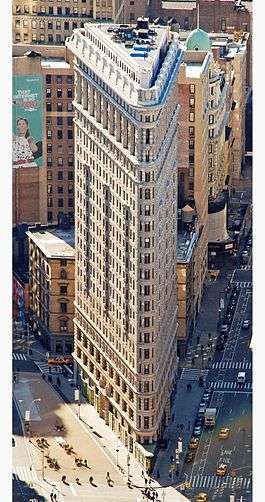 As computer technology helps architects design creative new buildings, triangular shapes are becoming increasingly prevalent as parts of buildings and as the primary shape for some types of skyscrapers as well as building materials. In Tokyo in 1989, architects had wondered whether it was possible to build a 500-story tower to provide affordable office space for this densely packed city, but with the danger to buildings from earthquakes, architects considered that a triangular shape would have been necessary if such a building was ever to have been built (it hasn't by 2011). ↑ "Circumradius". AoPSWiki. Retrieved 26 July 2012.